What is a book report or book review? What’s the point of book reports? 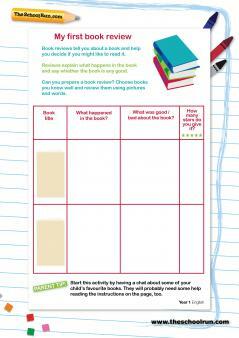 In some schools, book reports or reviews are regular homework tasks; in others, children may only write them occasionally, for example at the end of a literacy unit focusing on a particular book. ‘The main objective is for children to show their deeper understanding of a text, and also to demonstrate their reading preferences and think in more depth about the sorts of books they like reading,’ says teacher and English consultant Charlotte Reed. Book reports also help teachers assess children’s comprehension of their reading books, and ensure that books are read properly, not just skimmed over. And, of course, they help improve literacy skills such as spelling, grammar and vocabulary. What sort of standard is expected? In Reception, a book report might simply be a drawing inspired by the book, perhaps with a simple sentence written underneath. In Year 3, your child might be asked to divide their book review up with subheadings such as plot, characters, setting, my opinion. The first step when helping your child to write a book report is to make sure they've read and understood the book. Asking them questions to answer verbally before putting pencil to paper will help them clarify their thoughts on the book. If it’s a longer book, encourage them to make notes as they're reading. 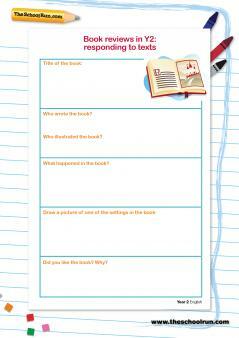 Use book review templates (you can download some below) to use as a basis for the report. 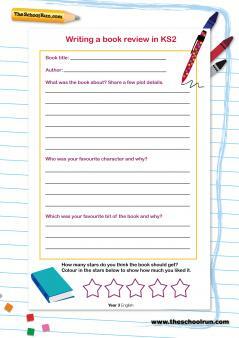 Prompt your child by asking questions about the book (‘What genre does this book fit into? Who would you recommend it to?’), or, for younger children, give them some sentence openers. You could also make a set of cards with useful words (mystery, adventure, exciting, funny, sad, scary etc) that they can use when writing reviews. Another good tip is to read other children’s book reviews on websites such as Reading Zone and Spaghetti Book Club to familiarise your child with the format of a book report, and help them consolidate his own opinions of the book. Unless your child’s teacher has specified a format, there are lots of ways to make writing book reports more interesting. ‘Your child could draw and annotate a picture of their favourite scene from the book, or write an emotional response from the viewpoint of one of the characters,’ Charlotte suggests. Other formats could include a newspaper report or an imagined interview with a character. Another good way to make book reports fun is to write mini reviews on Post-It notes. ‘Your child can then stick these inside book covers so he remembers what he thought of them – or, in the case of library books, so other children can read them,’ says Charlotte. To motivate your child, encourage them to send reviews to the author. ‘Lots of authors blog and tweet, so they could send reviews online, or by traditional letter,’ Charlotte says. ‘Most will write back, and this could be the start of a fantastic collection of correspondence from authors.’ And encourage your child to share their book reviews online, too: ‘It’s good for them to see their own work on the internet, and helpful to other children, as well,’ Charlotte adds.